The AgResults Vietnam GHG Emissions Reduction Project is a four-year, US $8 million prize competition that aims to develop, test, and scale up innovative technologies, tools, and approaches to reduce GHG emissions in the land cultivation and production stages for rice in order to ultimately reduce poverty, protect the environment, and reduce GHG emissions. Focusing on the Thai Binh province in the Red River Delta, the Project uses results-based prize incentives to attract a diverse pool of private sector actors that will test and scale technologies to increase yields and reduce GHG emissions in rice production. The Project is being conducted in two phases. Smallholder farmers in Vietnam are learning how to increase rice yields in a way that is environmentally sustainable. Current rice farming practices in South and Southeast Asia produce significant amounts of greenhouse gas (GHG), particularly non-carbon dioxide (CO2) emissions including methane (CH4) and nitrous oxide (N2O). These compounds are potent contributors to global GHG emissions that drive climate change-related extreme weather events including droughts and floods. Smallholder rice farmers contributing to these emissions, including those in Vietnam, are particularly vulnerable to climate-related shocks. The project is designed to incentivize private sector rice companies to develop, test, and promote the use of improved rice farming technology packages that both reduce GHG emissions and increase yields. Spurred by the prospect of prizes, companies will develop innovative strategies to market their solutions to as many smallholder rice farmers as possible. Successful packages will on average cost less to employ (through reduced fertilizer use) and increase yields, leading to increased incomes. The reduction in GHG emissions would also serve as a possible market opportunity for participating companies to capitalize on national or even global demand for low-carbon agriculture, helping Vietnam reduce emissions across the country. All proposed technology packages to be tested comprise elements that fall under the following categories, which are the most significant drivers of on-farm GHG emissions for rice. Setting up reliable verification systems is a crucial aspect of designing a PfR prize contest. Verification allows donors to authenticate results on which prizes are based. In Vietnam, verification is conducted differently in each Project phase. Phase 1 verification design relies on direct measurement of GHG emissions and rice yields for each technology and corresponding baseline. Phase 2 will largely use remote sensing data to verify emissions and yields and will employ existing models calibrated using field measurements of GHG emissions, rice yields, and crop production practices gathered in Phase 1. 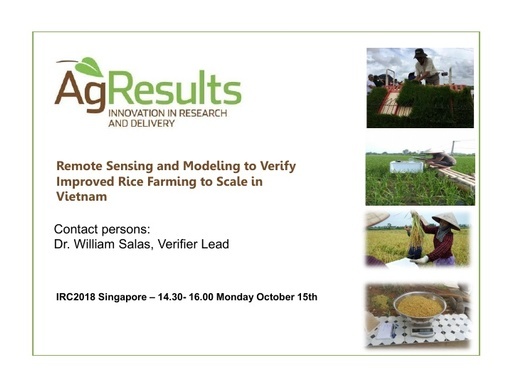 Phase I verification employed a combination of direct measurements and modeling of GHG emissions and rice yields for each implementer technology and corresponding baseline. 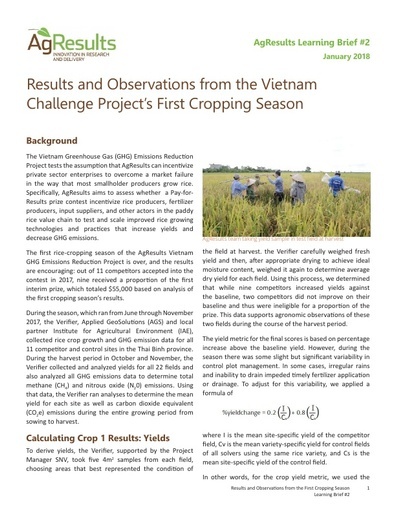 The Verifier conducted a baseline survey in early 2017 to define the most common rice cropping practices in Thai Binh. These sets of practices serve as the baselines against which to measure a competitor’s GHG emission reductions and rice yields. The Verifier set up control plots, one for each competitor, and managed the control plots per baseline management standards. Following a detailed calendar, the Verifier took on-field GHG measurements for Competitor and control plots weekly and at each major cropping event. The Verifier also made sure that competitors followed their proposed technology packages. Yield results at the end of harvest were obtained for each competitor and control plot. The Verifier quantified GHG emissions reductions and yield increases compared to the baseline and, after uncertainty calculations, proposed awards. Phase 2 verification uses existing proven rice crop verification processes and incorporates Phase 1 results to calibrate its models. 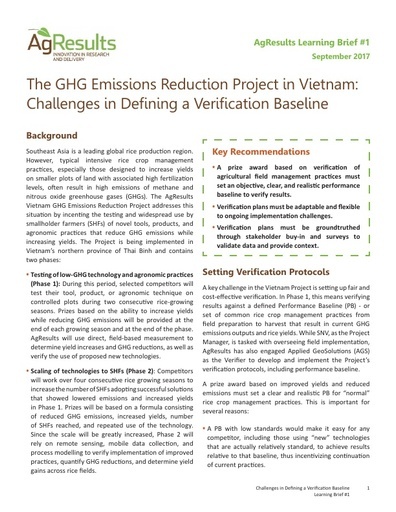 In this phase, the verifier will use two data platforms to collect raw data, which will feed into GHG and yield modeling systems to verify GHG emissions and yields in fields across the Thai Binh province. (Pre-Phase 2 and as) Verifier trains competitors in verification system and tools. Competitors engage/ organize farmers to participate. Competitors provide farm location, soil type, demographics to cloud-based data system through mobile apps. Verifier aggregates data and finalizes monitoring and oversight protocols. SHFs implement technology on associated fields, with competitors providing confirmation of technology implementation through mobile apps (GPS-tagged photos of field, drain, fertilizer, etc.). Using competitor-provided info, Verifier conducts event-based spot checks using mobile collection tools. Geospatial imagery used to monitor drain events and crop growth on all competitor fields. Verifier calculates prizes based on results from all fields that successfully implemented technology package. AgResults awards prizes to competitors. The project is expected to engage private sector rice value chain actors in testing and then scaling up the use of innovative rice farming technology packages that increase yields and reduce GHG emissions. Through this scaling up, smallholders will gravitate towards the technologies that are the most cost-effective to use, increasing yields and improving livelihoods. The project will lead to reduced GHG emissions, paving the way for wider uptake across Vietnam and potential monetization through carbon markets. 25,000 – 30,000 participating SHFs. 375,000 tCO2e in GHG emissions reductions. Increased awareness of successful GHG reduction strategies in rice farming. This table illustrates how our learning has evolved in Vietnam from project design through implementation. Further details can be found in the Learning Library. Below are recent learning products related to Vietnam. Dr. Tran Thu Ha is a pioneer development expert in investigating and implementing low carbon rice farming technologies. From 2010-2015, as the Project Director for the Environmental Defense Fund, she led the flagship Vietnam Low Carbon Rice Project in the Mekong Delta. 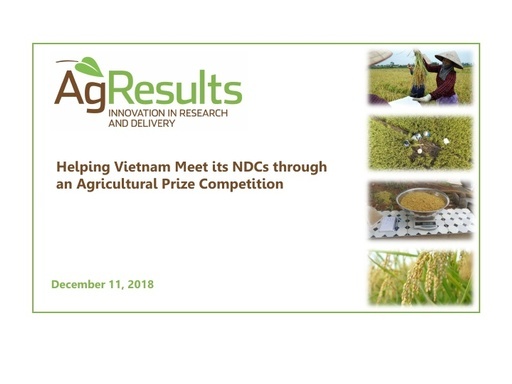 Since July 2016, as the Team Leader for the AgResults Vietnam Emissions Reduction Challenge Project, Dr. Tran has been leading the design and implementation of the nation-wide scale result-based financing project to catalyze the innovative technologies and unlock the investment from the private sector to enhance the uptake of transformational rice farming technologies for economic, social, and environmental benefits for Vietnam and the region. In 2003, Dr. Tran completed an International Masters of International Business Administration with distinction from Asian Institute of Technology, Thailand.